Sean Rafferty presents, with live music from cellist Johannes Moser and baroque group Ceruleo. Plus an interview with director Yaron Lifschitz. Sean Rafferty presents a lively mix of music, conversation and arts news. 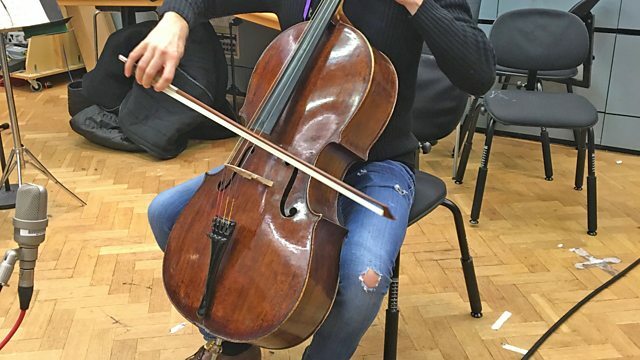 Live music today comes from cellist Johannes Moser, who is heading up to Scotland to perform with the Royal Scottish National Orchestra, and baroque group Ceruleo, who'll be at the Baroque at the Edge festival in London in the early new year. Plus an interview with director Yaron Lifschitz. Performer: Ronald Romm. Performer: Frederic Mills. Performer: David Ohanian. Performer: Eugene Watts. Performer: Charles Daellenbach. Music Arranger: Mark Kroll. Ensemble: Canadian Brass. Performer: Johannes Moser. Performer: Christopher Glynn. Performer: Anthony Halstead. Orchestra: Academy of Ancient Music. Conductor: Christopher Hogwood. Mozart: Horn Concertos 1-4: Halstead/AAM/Hogwood. Singer: Sumi Jo. Orchestra: Vienna Philharmonic. Conductor: Georg Solti. Orchestra: Royal Philharmonic Orchestra. Conductor: Clio Gould. English String Classics 2: Vaughan Williams/Warlock/Tippet/Elgar etc. Singer: Christine Schäfer. Orchestra: Berlin Philharmonic Orchestra. Conductor: Claudio Abbado. Mozart: Arias & R. Strauss: Orchestral Songs - Schafer, Abbado. Orchestra: Orchestra X. Conductor: Nicholas Kok. Performer: Christopher Warren‐Green. Conductor: Vladimir Ashkenazy. Orchestra: Philharmonia Orchestra. Orchestra: Los Angeles Philharmonic. Conductor: André Previn. Prokofiev: Alexander Nevsky Cantata, Lieutenant Kije Suite: Previn, LA Phil.